The Atkins Diet Induction Phase is the key to your success on the entire diet. Understanding exactly what you need to do and what you can’t do will determine whether the Atkins Diet can help you shed those unwanted pounds quickly and efficiently. The Atkins diet induction phase is the most restrictive part when starting the Atkins diet. You’re only on it for a short period of time, though, so take heart when you review the foods list. I was on it only for three weeks, and then moved on to the Weight Loss Phase, when more complex carbohydrates are allowed and the choices of foods are more varied. The Induction phase doesn’t have to be boring, though. You are able to eat any type of meat, fish or poultry and lots of vegetables. It also includes some fats like butter, cheese and certain oils. Lots of savory, healthy meals can be made using these ingredients. You will notice that you have more energy and feel less “groggy” after two or three days of eating on the Induction Phase because you aren’t weighted down with carbs and starchy foods, which tend to make you more sedentary. If you want to eat chicken, you can create a fajita by adding chopped tomatoes and onions and rolling it all in a lettuce leaf instead of a tortilla! There are also plenty of resources for the Atkins diet induction menu phase on the Internet and in book stores. Look for cookbooks labeled “low carb” or that have the Atkins seal of approval. The Atkins website itself also has lots of tips for making easy, quick meals for the Induction phase. One of my favorite staples during Induction was eggs – versatile, quick and inexpensive. I created omelets, scrambled casseroles with cheeses and meats and made delicious egg salads using ingredients on the allowed foods list. 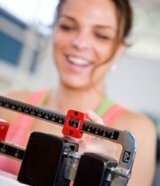 After a few weeks on the Atkins diet Induction Phase, you will be thrilled to see how much weight you’ve lost. Then you’ll really be motivated to go on to the Weight Loss Phase primed and ready for continued weight loss and happy with the new food choices you can add to your diet!